British Airways and American Airlines offer First class flights to Los Angeles. In British Airways First Class you get your own private suite with a spacious lie-flat bed that’s topped with a quilted mattress and duvet. You’ll also receive a pair of cotton pyjamas so you can change into something more comfortable and get a proper night’s sleep. The exclusive First Class amenity kit is designed by Liberty London and containing selected Aromatherapy Associates essentials to keep your skin fresh during the journey. If you’re flying to Los Angeles on the 787 Dreamliner you’ll be in a cabin of 8 suites rather than the usual 14. One of the major perks of flying British Airways First Class is that you’ll be invited to the Concorde Room at Heathrow airport, which has been redesigned with a “Best of British” theme. Inside the lounge you’ll discover discreet booths with full waiter service, along with private cabanas where you can take a nap or just sit back and relax. British Airways has invested a lot of money into its First Class offering, including a new First Class wing at Terminal 5 with an enhanced, private check-in area, two exclusive security lanes, and a direct walkway that leads seamlessly into the Galleries First Lounge and then the Concorde Room. American Airlines operates a 777 to Los Angeles equipped with its Flagship First product. Onboard the aircraft you’ll have a lie-flat seat and a sleep set created by sleep technology company Casper. The satin includes pajamas, slippers, mattress pads, pillows and blankets, while the amenity kit contains travel essentials from leading skincare and lifestyle brands 3LAB and Cole Haan. At the airport you’ll enjoy private check-in with access to an expedited security line, along with access to the airline’s Flagship First lounges in Los Angeles and Heathrow. AA has revamped its First Flagship dining experience, offering an improved sit-down experience, locally sourced ingredients, hand-crafted cocktails and craft beers. Upon arrival at LAX it’s well worth renting a car. LA is a car city and while public transportation does exist, it’s much quicker if you’re able to drive. Rental Car offices are located off airport, away from airline terminals, but the companies do offer convenient shuttles to and from the airport. You can also order an Uber or Lyft (you’ll be directed to the parking garage for pickup) or hail a taxi from outside arrivals. Another option is the FlyAway bus, which offers scheduled round trips between LAX and areas such as Hollywood, Long Beach, Union Station, Van Nuys and Westwood. 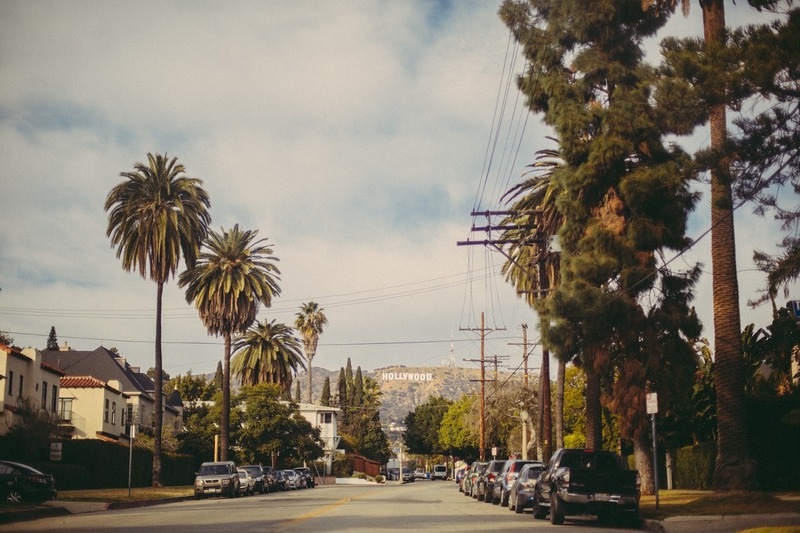 A one way fare to Hollywood will cost around $8. Or, if you’d like to use public transportation, you can hop on a shuttle bus to the Metro Bus Center, where you can board public buses to the Los Angeles area. If you’d like to be dropped to your door, you can use one of two shared shuttle services – Prime Time Shuttle and SuperShuttle. These shared ride services can be pre-booked and will the you where you need to go, although you may drop off other passengers along the way. 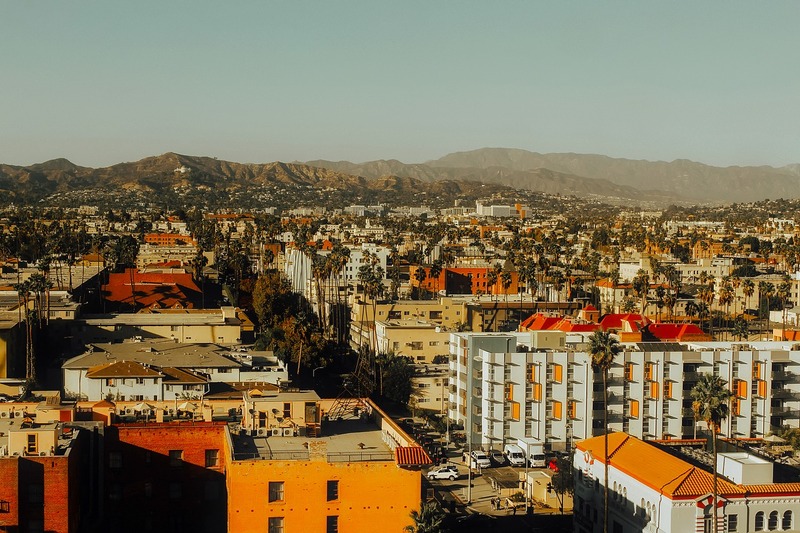 Where you stay will depend largely on whether you’d like to be based out near the beach in Santa Monica/Venice, or whether you’d prefer to be close to all the action in West Hollywood or Downtown. The Georgian Hotel is a stylish retreat with an Art Deco exterior right on the waterfront in Santa Monica. The hotel offers 84 rooms and suites and an ocean-view restaurant called Veranda, where you can enjoy sunset cocktails or Californian cuisine by Executive chef Garee Battad. If you’d prefer to stay downtown then The Standard is one of the most famous hotels to stay at. This 207-room hotel boasts massive guest rooms, a rooftop pool and a bar with arguably the best views of LA. You’ll also have access to an intimate rooftop beer garden, a 24-hour restaurant, and the full-service Ping-Pong club called the Paddle Room. Visit the Pink Wall – The Paul Smith Wall on Melrose is a dream for Instagrammers. Take a buddy and strike your best pose against this bright pink wall. Hollywood Walk of Fame – It may be super touristy but it has to be done! The Hollywood Walk of Fame is a pavement embedded with brass stars that have the names of famous actors and actresses inscribed on them. Santa Monica/Venice Beach – The brilliant thing about Los Angeles is that it has plenty of beaches to choose from. The closest to the city are Santa Monica and Venice Beach. Both are great for sunbathing, people watching and dining out. British citizens should apply for an ESTA before travelling to the USA. You can do so online and if approved, the ESTA is valid for two years, for multiple entries up to 90 days. Make sure you have one before you go otherwise you won’t be able to travel.